Home > Selling at Auction > Why Sell at Auction Instead of a Shop? Selling items at auction is a gamble. The price could go through the roof – in which case you’re in the money – or it could remain close to the floor in which case you lose out. Of course, you can protect yourself by using a reserve price (which means the bidding has to go over the price in order for the item to be sold), but that costs you money as you have to pay the auction company. So when should you sell at auction and when should you simply put an ad in the paper and sell for a fixed price? To be honest, most common goods are best sold at a fixed price. There needs to be some value, be it age or rarity, to warrant selling an item at auction and hope to make a good return from it. That applies also to books or old LPs or CDs. There might well be millions of copies out there – who would bid any big money on, say, The Eagles Greatest Hits? – so you’re better off selling it. (if you’re feeling generous, try Freecycle instead). So first you need to take a look at what you’re selling. If, say, you’ve taken out an old fireplace surround from your house and it’s in good condition, are you better off selling for a fixed price through an ad (or even to a salvage furniture dealer) or by auction? Do your research. Find out a little about the style of the piece and its age. When you know more, you can make an informed decision – and also write a better description. If you have an item with some rarity – a limited edition of a CD or toy, for instance – it might well be worth selling it at auction. 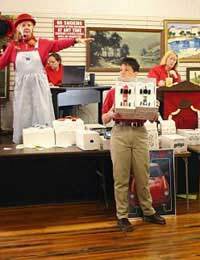 Whether you sell at an online auction or an in-person auction can depend on several factors. Online is easiest, taking the least effort on your part, but might not bring you the highest price if the item is specialised or very rare. If it’s valuable and has to do with music or movie memorabilia, as an example, you might want to enter it into a specialised auction, carried out by several auction houses regularly. Much the same criteria apply to vintage cars. If you choose to sell without a reserve price, then you need to establish a starting price for bids. If you’re reasonably confident people will bid well on the item, you can afford to start with a low opening price. If you’re more cautious, keep the opening price relatively high – but not so high as to put people off bidding; it’s a fine line. Again, it pays to do your research and discover the selling price of similar items. The more knowledge you have, the more you might end up receiving for your item. But always remember that there’s no guarantee your item will fetch a similar price. In the right instance, selling at auction can pay off handsomely. Antiques are a booming market and if you pick the right auction, you can come out well ahead by putting your item in front of people who are interested in that particular thing. Note, though, that in most cases the big auction houses will only deal with high ticket items. Unless there’s something very rare about it, Sotheby’s won’t be handling your great-great Aunt Vi’s 19th century silver photo frame. Use your common sense. Look around first. Research doesn’t need to take long. But it will pay off in the long run. @emo31 - Ive included a link from the Property Ombudsman; Valuers & Auctioneers General Obligations which gives code of practice guildelines and advises how to complain. link here.